Hawken’s Early Childhood Center provides an environment that supports our nationally recognized early childhood programming. The interior of the facility resulted from collaboration with Creative Environments Design Collaborative, a nationally known education design firm, to accommodate Hawken’s unique developmental continuum, which is grounded in the belief that the aesthetic environment plays a significant role in a child’s development. The space enhances programming by inspiring exploration, supporting a range of social learning experiences, and encouraging development of motor skills. Hawken’s early childhood team has researched and created The Hawken Developmental Continuum. Establishing Hawken as one of the most cutting edge early childhood programs in Ohio and beyond, the Continuum enables Hawken educators to deeply know their students by benchmarking their growth across five domains of development: social and emotional, approaches to learning, cognitive, language and literacy, and physical development. 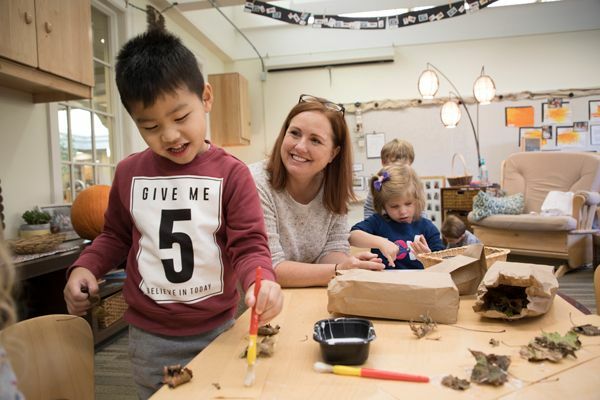 The Hawken Developmental Continuum is designed for children from preschool through second grade and sets reasonable expectations for grade level performance across the domains based on state, national and international education standards. The Continuum also allows teachers to identify a child’s strengths and areas for improvement, which aids in planning curriculum that supports developmental growth and promotes student success.